Transport infrastructure of Ho Chi Minh City is upgrading and expanding to meet the transport traffic is increasing rapidly, so the installation of the traffic signal at the intersection is necessary to coordinate the most traffic and is not to traffic accidents on all roads. 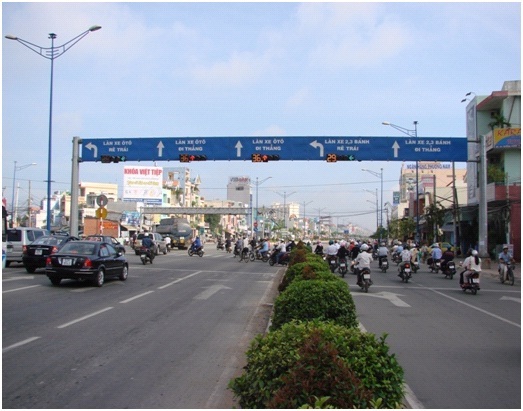 In addition, the construct of the traffic signal system at the intersection to facilitate development of an effective separation of traffic to main roads and side axis turn to the district of Ho Chi Minh City. At the same time contribute to the construction and development trend coordination network traffic and bandwidth, showing the application of dynamic high-tech achievements in the service benefits the community especially in the transport sector public. Since then, urban traffic safety and contributing to economic activities, political, cultural, and transportation in the area of Ho Chi Minh City. - Lamp countdown lights cycle time. - Light signals for pedestrians (pedestrian lights). The lamp is made to assemble the LED (emitting diode) type I specialized in traffic to create the desired shape. On the lamp has a transparent plastic lens to create a uniform distribution of the scattered light for this LED. This LED system is powered and controlled on a circuit board mounted behind the lamp. Angle is 60 degrees to 90 degrees. Bole of elliptic cylindrical shape pressed close stylized, cylindrical body made of aluminum, and iron core inside the cylinder body is galvanized to ensure the strength of the cylindrical body, the cylindrical body mounted lamps. On the cylindrical body has a wiring hole. Wiring hole covered with lid sink and fixed by hexagonal screws sunk into the body of the standard in a beauty for the wiring. Inside the cylindrical body has domino wiring and chassis to attach wiring Domino. After finishing machining, standard’s surface treated and painted dark with static methods to ensure anti-corrosion properties of the environment, and sun glare. Bole is modern design in accordance with the requirements of urban planning and replenishment for routes with relatively large roadways. Bole has a circular cylindrical shape, made of iron, the cylindrical body mounted lamps. On the cylindrical body has a wiring hole. Wiring hole covered with lid sink and fixed by hexagonal screws sunk into the body of the head in a beauty for the wiring. Inside cylindrical body has domino wiring and chassis to attach wiring Domino. After finishing machining, cylindrical surface treatment, hot dipped galvanized and painted in electrostatic recording method ensures anti-corrosion properties of the environment, and the bright sun, the style in accordance with the requirements of modern urban planning and replenishment, which is used to route the road is relatively small. Bole made of iron, on the cylindrical body has a wiring hole and lamps. Wiring hole covered with lid sink and fixed by hexagonal screws sunk into the body of the bole in a beauty for the wiring. Inside the body bole has domino wiring and chassis to attach wiring domino. After finished machining, cylindrical surface treatment, hot dipped galvanized to ensure anti-corrosion properties of the environment and painting the gray bole. On top of bole is attached to the traffic signal reaching out to the street, it should be cone shaped polygons made of iron, the traffic signal lights mounted headlights; guarantee of lights hung 5,5 m (measured from the lowest point of light to the road). Bole has modern design in accordance with the requirements and the urban planning for roads with lane traffic. Polygonal cone-shaped bole made of iron. Bole has arch pix ought to have two bodies, on each body bole has a wiring hole. Wiring hole covered with lid sink and fixed by hexagonal screws sunk into the body of the head in a beauty for the wiring. Inside the body bole has domino wiring and chassis to attach wiring domino. After finished machining, cylindrical surface treatment, hot dipped galvanized to ensure anti-corrosion properties of the environment and painting the gray bole. On the first bole mounted two octagonal cross beams connecting two cylindrical bodies to form the welcome gate, length depending on the width of the road; been divided into three sections for easy transport and installation by long beams; and to create a solid foundation for the two beams, the steel diagonal L knit together, between two light beams. 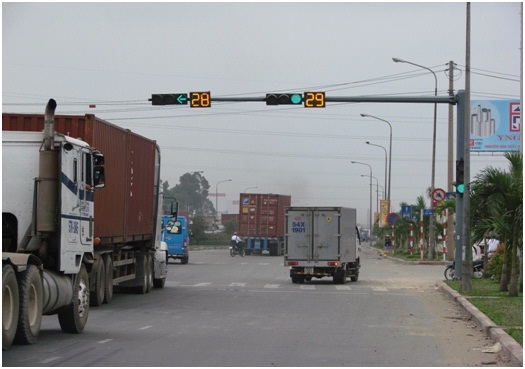 On two horizontal beams and installation of traffic signs and lights clusters; ensure high hanging lights to be greater than or equal to 5.5m (measured from the lowest point of light to the road). In addition, frame and floor work to be able to install, maintain, repair and easy thing to do is avoid the objects can fall down the road while is constructing, do not cause accidents to pedestrians and vehicle traffic below. Bole has with modern design in accordance with the requirements of urban planning and replenishment for the distributed multiple-lane motorway route traffic. Use PLC Mitsubishi controller, is designed for use in industrial control. This device has high anti-interference capability, designed and manufactured by new technology standards BVQI/UK, used to program the traffic signal system. Program run by the mode or multi-program, or real time or scheduled mode. Decoder circuit is designed with a PLC Mitsubishi controller to increase the ability to control the PLC controller 32 controls. Card designed capacity of each intersection requires 2 phases, 3 phases, many phases. Therefore the traffic control will be implemented in a flexible, flexible and more reasonable in the development of the current traffic conditions. - Control the traffic lights work with the light cycle diagram cleared or not cleared. - Control the traffic lights work with many different light cycle diagram of the day. - Control the independent (autonomous mode). - Control activities in real time or scheduled. - Controlling operations center if connected to the center. - All the parameters related to the light cycle be changed easily and conveniently, display operating status clearance to mount the display module or equivalent type compatible with the PLC, so we can modify the program or time without the devices. - Stable operation and continuous 24/24 hours in climatic conditions in Vietnam, stored data when power is lost on the eighth day. - In addition to the normal light cycle diagram, traffic signal control cabinets work with the special cycle diagram: blink yellow; shut down the whole. - Works with two-phase control mode when necessary to develop multi-phase control just append controller expansion card and setup control mode. - Works with auto or manual control.